It’s been a very interesting period for the electronic music enthusiast with electropop gaining a very prominent profile via some of the new artists emerging. The term ‘Renaissance Period’ has been bandied about and few could argue that the current healthy scene shows little sign of slowing down as more and more artists and bands emerge to the attention of a wider audience. Enter GRIMES, aka Claire Boucher – a Canadian artist who employs several disciplines, including art, performance and music and pulling in musical influences featuring everything from K-pop to glitch along the way. Claire is quoted as describing her work thus: “The only means through which I can be fully expressive. It is both an ethereal escape from, and a violent embrace of, my experience. The creative process is a quest for the ultimate sensual, mystical and cathartic experience and the vehicle for my psychic purging”. 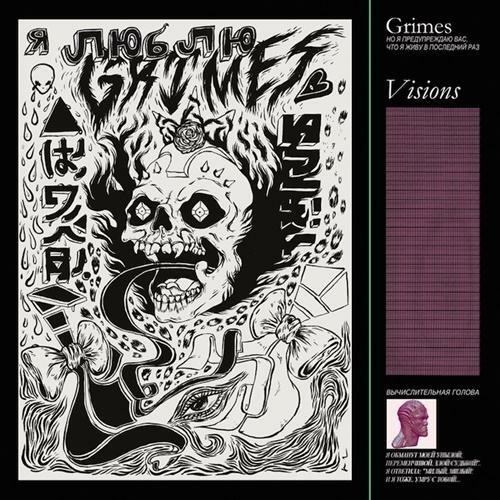 Grimes had already been established with two separate releases in 2010, Halfaxa and the Dune-influenced Geidi Primes , that gathered together a collection of brooding electronica overlaid by Boucher’s distinctive soprano vocals. The result was an ethereal, other-worldly quality that often lent an hypnotic element to the music. The experiments are not necessarily always successful, but songs such as ‘Dream Fortress’ and ‘My Sister Says The Saddest Things’ captured a unique painful beauty that’s difficult to draw comparisons to, although she’s often mentioned in the same breath as Lykke Li and Austra (and there is also a hint of early Virginia Astley). The striking thing about Grimes is the way tunes emerge from these often complicated and bizarrely constructed songs (Boucher clearly doesn’t have much time for verse, chorus, middle-eight when writing her material). There’s a percussive quality to a lot of the work that drives the songs, building up an infectious rhythm that gets feet tapping even when you’re still waiting for the melody to appear. ‘Genesis’ is the track getting attention lately through radio play and it’s easily one of the standout tracks of the album. A Kraftwerkian melody provides the base for Boucher’s spacious vocals while once again a clever percussive rhythm keeps things moving along at a good pace. ‘Oblivion’ is in similar territory but is a much earthier affair with a bassy synth melody and a clever layering of vocals that produces an accessible slice of Gothic Electropop. ‘Oblivion’ also has a few ‘old school’ touches to surprise the listener. There’s more apparent nods to Kraftwerk on ‘Eight’ with the rhythm of the song built up from a repetitive vocoder element. And this track illustrates how Boucher is prepared to try more unusual ideas to build a song. It’s this experimental approach that throws up such pleasant surprises and more than a few challenges. Boucher also finds time to collaborate with fellow Canadian artists on the Visions album. Doldrums do the honours on the pneumatic melodies of ‘Colour of Moonlight (Antiochus)’ which is another fine example of the way Boucher’s treated vocals can weave captivating elements into her music. Electronica artist Majical Cloudz joins Miss Claire on the evocative ‘Nightmusic’ where subtle synth rhythms are seamlessly merged with darker, moodier melodies. As an album, Visions is a joy and a challenge that will reward the determined listener looking for subtler colours in the electronic music tapestry.